The “Education, Health Care, and Middle Class Tax Relief Fund” will get its cash flow from a modest-income tax on the wealthiest 1.2% of Washingtonians. Individuals will still have zilch income tax until they make at least $200,000/year, or $400,000 for couples filing jointly. The income tax will be a marginal tax rate set at 5%, which means only income above and beyond that mark is taxed (so if you make $200,001 in a year, your annual income tax will add up to a whopping one nickel). The marginal rate increases to 9% for incomes above $500,000/year, or $1 million for couples. Predictably, this concept of creating a new tax has sparked quite a bit of debate around the fairness of this measure (someone should hide those barrels of tea at the port). However, the idea that 1098 will hurt entrepreneurship or punish rich people is way-dumbed-down way of looking at it. 1098 is about fixing an unfair tax system, not piling on the taxes. Not to mention Washington State is currently ranked dead last in tax fairness in the whole country. 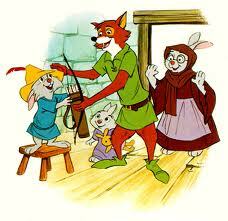 If 1098 is better than Robin Hood I'm definitely voting YES! The two-thirds of Washingtonians who are home owners will all benefit from state-owned property taxes being reduced 20%, and I would bet my next-month’s rent that more rich people than poor people own their houses. Even better, the benefit of these property tax reductions will likely be passed on to home renters via reduction in rents. An even greater positive effect on our economy will come from eliminating the Business and Occupation Tax for 89.6% of businesses (a B&O tax is style of tax that has largely disappeared in the U.S. because of its unequal and unintelligent burden on small businesses; it is usually replaced by a business income tax). Now I’ll put November’s rent on the line to claim that probably more rich people own business than poor people, allowing them most of the benefit of eliminating the B&O tax. Calling I1098 the “Robin Hood tax” as some have playfully put it, “robbing the rich to feed the poor” is actually the harshest way one could describe it, and to a great extent that comparison is plain wrong. In reality, Initiative 1098 is a smart reworking of Washington State’s unfair tax system. It removes undue burdens upon poorer families, while imposing a modest-to-nonexistent burden on our wealthiest 1.2%. The Washington Bus and YOU both know that hating taxes for the sake of hating taxes is not what its all about. Let us leave our unfair tax system behind. Let us reduce the burden of taxes on our poorest citizens, so they don’t have to spend all their money on taxes. The families among the lowest 20% of incomes end up paying 17% of their income in state and local taxes, while the top 1% of earners fork over less than 3%. Let us make it easier for small business to enter a market and compete. Most of all, let us invest in our future, by saving money every year that will be dedicated explicitly to improving education and health care. We can do it Bus people! Let’s all get out and say a loud YES on 1098! « R-52uesday! Rescuing the Future!